Broadband as a utility. What does that mean for rural areas? I had a few emails last week asking me about what it means to define broadband as a utility. So I thought I’d try to tackle the question, which came up after the Minnesota State Bar Association (MSBA) meeting on broadband. At the meeting, someone compared the drive for border to border broadband to the Rural Electrification Act, which provided federal loans for installation of electricity to rural areas, often through cooperative electric power companies. Someone else asked if that was really what the country needed. Here’s the catch 22 – metro areas are often angling for competition while rural and remote places are hoping for one, good solution. When visiting Minnesota last year, FCC Chairman Wheeler talked about competition being ingrained in the American psyche. But in very rural areas, where it’s difficult to make a business case to serve so few homes in such large geographic areas, competition can be detrimental. For example, someone at the conference mentioned FirstNet as way to bring better broadband to anchor institutions in rural areas. On the one hand, it’s a great way to serve those institutions and maybe save money by allowing government entities to share connectivity. On the other hand, you risk taking away a “big” customer from a potential broadband provider who might also serve local homes and businesses. The amount they can charge the big guy offsets the cost they charge home users. The decision provides protections to customers. It treats wired and wireless similarly to wired broadband. One goal was to promote competition. But it really focuses on making sure that the providers offer and maintain unfettered access through broadband more than to broadband. It ensures that once online, each user shall have equal access to materials, services and each other. BUT it doesn’t as directly address the folks who can’t get online. To build on the analogy of the superhighway, it prohibits providers from creating tolls roads or privileged pay-lanes but it doesn’t push roads everywhere and it expressly does not address price. It does safeguard against the idea of an “Internet Junior” for some areas but it doesn’t promote more infrastructure. Need to think of the future – we’re setting a goal to be reached in the future, not immediately. In you look out 10 years, there’s going to be 1 pipe into houses and that’s going to be fiber. The notion of building 2 mediocre networks for the sake competition is short sighted. The pipe is a natural monopoly. We need to set the goals for the future – not next year. We need to be aggressive – we need to protect consumers. Consumers have been screwed by provides for so long that we need to protect them. No we don’t have a monopoly; it’s just not true. We have more than one pipe in the house now. There are implications in the statement that will have an impact on policy. From the rural perspective I think communities and policymakers need to think about who and how promote access. It seems like funding helps – again at the MSBA both providers and policymakers alluded to the collaboration occurring because of the State Broadband Funds maybe a hybrid solution is best – a little bit utility, a little bit free market. BUT these issues are different than the issues addressed by the FCC in their Open Internet policy. The Northeast Service Cooperative (NESC) recently posted a presentation that they have been giving to the project with area community leaders. It’s an nice update on what’s has happened with the project and what is planned or 2012. The Northeast Middle Mile Fiber Project will make broadband services viable for a vast geographic region, creating an initial backbone that will serve hundreds of sites along 915 miles of fiber within eight counties including St. Louis, Lake, Cook, Koochiching, Carlton, Pine, Itasca, and Aitkin. A number of anchor institutions will participate in the Project including state and municipal agencies, the Arrowhead Library System, SISU Medical System, Minnesota Association of Mental Health Programs, and twenty-eight public school districts. Overall, the project will impact 613,092 residents, 244,574 households, thousands of businesses and governmental agencies and 35,855 public school students from across Northeast Minnesota. 415 miles constructed in 2011 – including the following areas – Built into communities within Carlton, Lake & St. Louis County including: Aurora, Carlton, Cloquet, Cromwell, Duluth, Ely, Thomson, Floodwood, Hermantown, Hibbing, Moose Lake, Mountain Iron, Proctor, Silver Bay, Soudan, Two Harbors, Virginia, Willow River, Wrenshall, Gilbert, Eveleth Eveleth Tower Barnum , To we r, Barnum. Areas slated for constructed in 2012 – McGregor, Orr, International Falls, Cotton, Chisholm, Buhl, Keewatin, Cook, New Duluth, Gary, Biwabik, Nett Lake, Fond du Lac, North Shore Communities (Grand Marais, Grand Portage, Portage, Lutsen, Schroeder Tofte). They also look at what is means to be connected – from a community perspective. I think the presentation is very good – even if you’re not in Northeast MN – although the possible solution they elaborate upon may not be available in other areas. 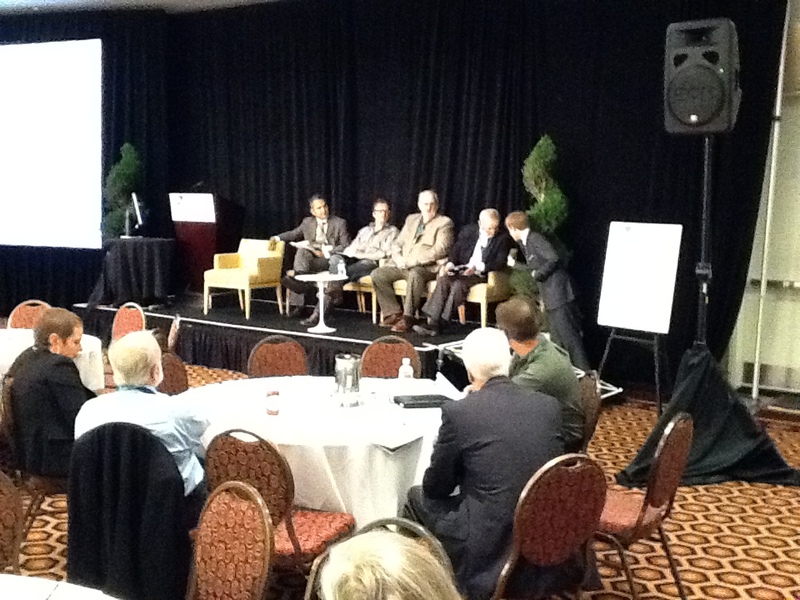 Today I attended the Northern Regional Broadband Networks Forum in Duluth. The interest in broadband in the business community in Duluth is clearly high – as demonstrated by the standing room only situation in the room. It was a nice look at all aspects of broadband of the community and a nice eye opener for folks who may not be using broadband, cloud computing or social media as often (or maybe as well) as the speakers. I think it will spur folks to go home and look at how they can implement broadband tools in work, home and community. As a reminder – this week I am at the NATOA (National Association of Telecommunications Officers and Advisors) Conference in San Francisco. Interesting panel at NATOA discussion the open internet and net neutrality. Google thinks that Net Neutrality is essential because it means that the user is in control. Richard Bennett of ITIF says that this is easy to say, hard to regulate. The discussion is now moving towards the new FCC rules announced yesterday. It is City of Eagan’s intent to obtain and own a fiber cable plant to be used for city purposes, wholesale access to telecommunications providers, or open access to telecommunications providers within the corporate limits of the City of Eagan. They are looking for proposals by September 13, 2011. The contract will be awarded September 20 and the project should be completed by November 18. You can get all of the details on the RFP. Good luck to those who will propose! One of the best thing about being back in Minnesota is that I’m able to attend some of the fun groundbreaking events to celebrate new broadband deployment (much of it sponsored by ARRA funding). Yesterday I was able to attend the groundbreaking in Cologne, Minnesota. They were celebrating the beginning of their new fiber optic ring, which will be over 122 miles long and will connect 86 entities at 56 sites throughout Carver County, including city, county and township governments, schools, fire departments, public safety towers and law enforcement agencies.